A robot pet is the dream of many a child, thanks to creatures such as K9, Doctor Who’s trusted companion, and the Tamagotchi, bleeping nightmare of parents worldwide. But both of these pale in comparison (sorry, K9) to Petoi, the walking, meowing, live-streaming cat from maker Rongzhong Li. Mentioned on IEEE Spectrum: https://spectrum.ieee.org/automaton/robotics/humanoids/video-friday-boston-dynamics-spotmini-opencat-robot-engineered-arts-mesmer-uncanny-valley More reads on Hackster: https://www.hackster.io/petoi/opencat-845129 优酷： http://v.youku.com/v_show/id_XMzQxMzA1NjM0OA==.html?spm=a2h3j.8428770.3416059.1 We are developing programmable and highly maneuverable quadruped robots for STEM education and AI-enhanced services. 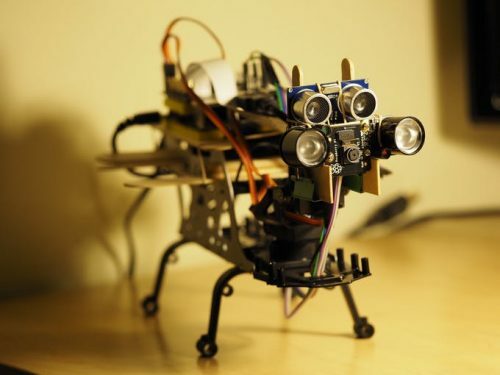 Its compact and bionic design makes it the only affordable consumer robot that mimics various mammal gaits and reacts to surroundings. 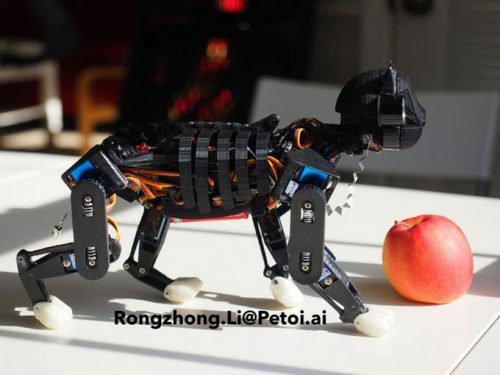 Not only have cats conquered the internet, they also have a paw firmly in the door of many makerspaces and spare rooms — rooms such as the one belonging to Petoi’s owner/maker, Rongzhong Li, who has been working on this feline creation since he bought his first Raspberry Pi. 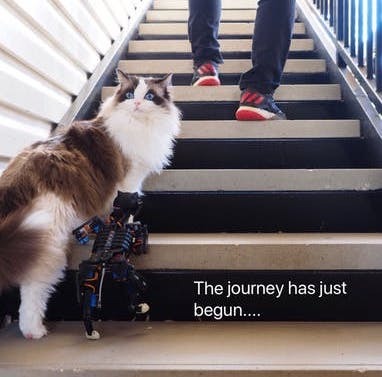 Petoi is just like any other housecat: it walks, it plays, its ribcage doubles as a digital xylophone — but what makes Petoi so special is Li’s use of the project as a platform for study. I bought my first Raspberry Pi in June 2016 to learn coding hardware. This robot Petoi served as a playground for learning all the components in a regular Raspberry Pi beginner kit. I started with craft sticks, then switched to 3D-printed frames for optimized performance and morphology. Various iterations of Petoi have housed various bits of tech, 3D-printed parts, and software, so while it’s impossible to list the exact ingredients you’d need to create your own version of Petoi, a few components remain at its core. The Pi takes no responsibility for controlling detailed limb movements. It focuses on more serious questions, such as “Who am I? Where do I come from? Where am I going?” It generates mind and sends string commands to the Arduino slave. Li is currently working on two functional prototypes: a mini version for STEM education, and a larger version for use within the field of AI research. You can read more about the project, including details on the various interactions of Petoi, on the hackster.io project page. Not quite ready to commit to a fully grown robot pet for your home? Why not code your own pixel pet with our free learning resource? And while you’re looking through our projects, check out our other pet-themed tutorials such as the Hamster party cam, the Infrared bird box, and the Cat meme generator. Awesome work Li, not only very skilled hardware but the movements are very life-like. Needless to say I want one! In fact put me down for an army. Look forward to hearing more as you develop it further. But my cat would hate it. Where can I get the big, fluffy one? Super cool, by the way. Certainly seems pretty fun to work with. No tail? A Manx cat? I too want one! Sadly, my Siamese siblings rules the roost here. It is really cool. awesome. Very inspiring!! i hope to reach this level someday. Question that rises: are prototypers cat-people?? Where would the internet be without cats?